Former Campbellsville catcher and 2010 Diamondbacks NDFA Richie Rowland spent a lot of time at designated hitter for rookie-level Missoula, but Rowland stands out among players who caught this season. Rowland batted .291 with five home runs, 34 RBI and 19 runs scored in 67 games. Former UK catcher and 2010 Astros NDFA Marcus Nidiffer moved from behind the plate to first base as a professional and let his bat do the talking. Nidiffer slugged 14 home runs and batted .286 in 69 games en route to being named BluGrass Baseball rookie of the year. 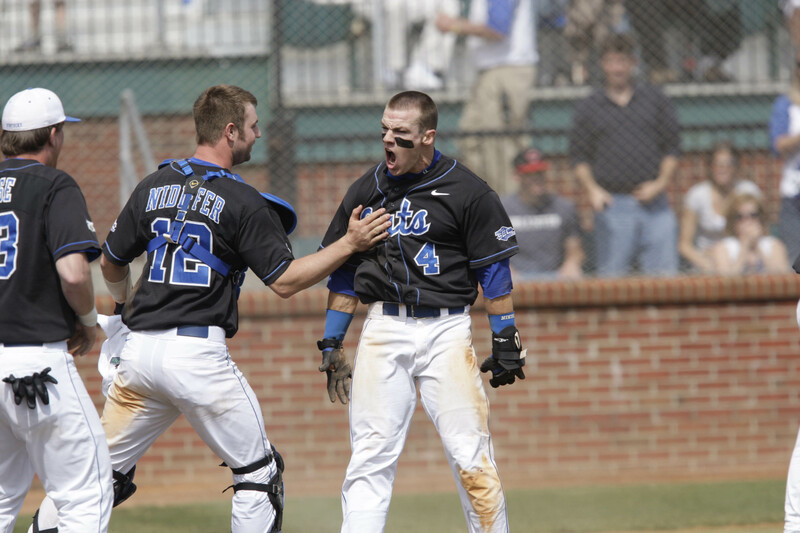 Nidiffer should open 2011 with the Lexington Legends. One-time UK outfielder Jason Kipnis transferred to Arizona State, where he became a NCAA all-American, and has done nothing but hit since being drafted by the Indians. Kipnis, who moved to second base as a professional, batted .307 with 16 home runs, 74 RBI and 96 runs scored for AA Akron in 2010. Former UofL infielder and Giants prospect Chris Dominguez led all Kentucky minor leaguers with 21 home runs and 101 RBI in 2010. Dominguez batted .272 with 85 runs scored for low A Augusta and added 14 stolen bases for good measure. Former Morehead St. shortstop and 2010 White Sox draftee Drew Lee played primarily at second base during his first professional season, but shortstop remains the weakest position for Kentucky minor leaguers so he slots in here on the All MiLB team. Lee batted .282 with five home runs, 39 RBI and 32 runs scored in 62 games for rookie-level Bristol. Former NKU outfielder and 2010 BluGrass Baseball hitter of the year Jake Shaffer led all Kentucky minor leaguers with a .336 batting average in 2010. Shaffer also slugged nine home runs and tallied 78 RBI. Shaffer also led Kentuckians in on-base and slugging percentage. Lexington Catholic alum and Twins farmhand Ben Revere battled through adversity in 2010 to post another solid season. Revere batted .305 with 44 runs scored and 36 stolen bases for AA New Britain. His season appeared to end early after being hit in the face by a pitch in August, but Revere returned to New Britain in late September and earned a surprise call-up to Minnesota. Former UK outfielder Collin Cowgill was among the top five Kentucky minor leaguers in almost every major offensive category. Cowgill batted .285 with 16 home runs, 83 RBI and 89 runs scored for AA Mobile. Cowgill also stole 25 bases on the season. If not for Chris Dominguez’s power surge, former WKU infielder Wade Gaynor would be the third baseman on this team but instead he slots in as the designated hitter. Gaynor batted .286 with 10 home runs, 80 RBI and 91 runs scored for low A West Michigan and is in the running for Detroit Tigers MiLB player of the year. North Hardin alum and BluGrass Baseball pitcher of the year Nathan Adcock stood out among Kentucky pitchers with an 11-7 record and 3.38 ERA in 2010. Adcock struck out 113 batters and walked just 28 in 141.1 innings pitched for high A Bradenton. Former NKU right-handed pitcher Josh Lueke was traded to the Seattle Mariners organization midseason in the Cliff Lee trade and has elicited controversy in Seattle since due to his past legal trouble, but there is no denying his success on the mound in 2010. Lueke finished the season 5-1 with a 1.86 ERA and 17 saves in 50 games between four different teams. He struck out 94 batters and walked just 15 in 63 innings pitched.